I looked right through it. Beyond bedtime on a December 24th sometime within my first eight or so years of life, I caught them red-handed. 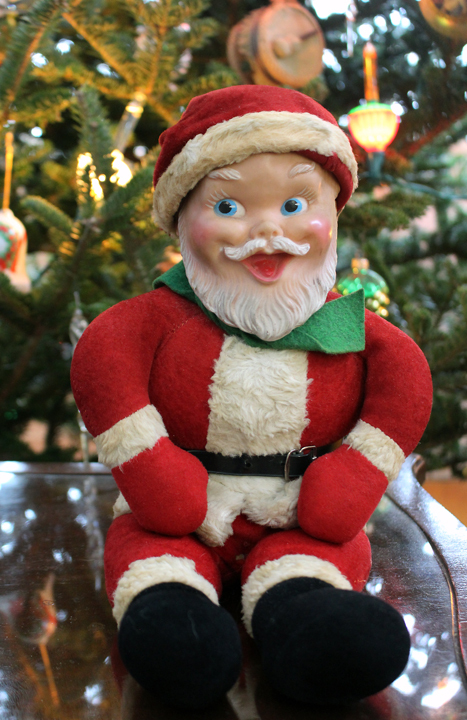 My parents, grandparents and great-grandmother had taken over Santa’s responsibilities right there in the living room. I had gone to bed but wasn’t sleeping even though I wanted to. Considerable holiday enthusiasm and experience had versed me in bedtime protocol: Santa’s arrival is quicker when sleep consumes the night. But my wandering mind decided on a stop to the bathroom. It was down a short hallway at the top of six steps in our split-level house. From there, anyone could see straight into half of the living room. The stairway walls served as blinders, funneling the scenario directly into my line of vision. I saw my great-grandmother decorating the tree, Dad wrestling with some cardboard and a screwdriver on the floor, and an assortment of hands dipping into the cashew dish. Then I saw something else—every set of eyes seeing me see them. I wasn’t much of a detective back then. Analyzing evidence requires questions and I had none. I couldn’t even come up with alternative facts like perhaps Santa was a little shorthanded that year, needed the help and my family pitched in. No, not me. Instead, my mind was a void to what I witnessed before my very eyes. Stunningly, I was un-seeing this. But for my parents, the jig was up and they stopped by my room one night afterward to fill me in. My reaction caught them completely off guard. I couldn’t widen my eyes enough to trough all the tears. I didn’t want to disbelieve what I had treasured believing for so long. In that emotionally-crazed moment, I at least had the wherewithal to realize that the Easter Bunny was questionable, too. To my parents’ credit, I found they had tried to squeeze out another holiday of believer-days for me. Evidently, I’d begun to ask more questions than I thought. So, the summer before the incident, our family made a visit to a nearby amusement park called Santa’s Village. It was complete with an arena named the Polar Dome where I played most of my childhood hockey. Little did I know how ice-sheet technology of the day would play into our adventure. Our focus was on a chat with St. Nick. He was said to live on-site seasonally and he brought his North Pole with him. The Pole magically retained layers of ice even in hot weather. In reality, it was an eight-inch pipe about five feet high that arena maintenance had rigged with a water supply and freezer coils. Santa also sported a real beard. When we met, he insisted I give his white whiskers a tug for good measure. Then we walked to the stable where I met actual reindeer, one in particular named Rudolph. I immediately detected that his nose wasn’t red and asked about it. While such penetrating questions might have made Mom and Dad twitchy, Santa rebuffed it kindly. He told me Rudolph’s nose only turned red in much colder temperatures, not unlike humans. The colder the temperature, the redder the nose, and it was ghastly cold where he normally lived. So there. He said it. I believed it. That settled it. This is what my parents did. They brought me one more Christmas Eve. And I still believe in the magic.